This article is about the novelist and computer programmer. For other people, see Andrew Weir (disambiguation). Andrew Taylor Weir (born June 16, 1972) is an American novelist whose debut novel, The Martian, was later adapted into a film of the same name directed by Ridley Scott in 2015. He also worked as a computer programmer for much of his life. He received the John W. Campbell Award for Best New Writer in 2016. Weir was born and raised in California, the only child of an accelerator physicist father and an electrical-engineer mother who divorced when he was eight. Weir grew up reading classic science fiction such as the works of Arthur C. Clarke and Isaac Asimov. At the age of 15, he began working as a computer programmer for Sandia National Laboratories. He studied computer science at UC San Diego, although he did not graduate. He worked as a programmer for several software companies, including AOL, Palm, MobileIron and Blizzard, where he worked on the video game Warcraft II: Tides of Darkness. Weir began writing science fiction in his twenties and published work on his website for years. He also authored a humour web comic called Casey and Andy[NB 1] featuring fictionalized "mad scientist" versions of himself and his friends (such as writer Jennifer Brozek) from 2001 to 2008; he also briefly worked on another comic called Cheshire Crossing bridging Alice in Wonderland, Peter Pan and The Wizard of Oz. The attention these gained him has been attributed as later helping launch his writing career, following the failure to publish his first novel attempt called Theft of Pride. His first work to gain significant attention was "The Egg", a short story that has been adapted into a number of YouTube videos, a one-act play, and is the overarching concept of Everybody, the third album by American rapper Logic. Weir is best known for his first published novel, The Martian. He wrote the book to be as scientifically accurate as possible, and his writing included extensive research into orbital mechanics, conditions on the planet Mars, the history of manned spaceflight, and botany. Originally published as a free serial on his website, some readers requested he make it available on Amazon Kindle. First sold for 99 cents, the novel made it to the Kindle bestsellers list. Weir was then approached by a literary agent and sold the rights of the book to Crown Publishing Group. The print version (slightly edited from the original) of the novel debuted at #12 on The New York Times bestseller list. The Wall Street Journal called the novel, "the best pure sci-fi novel in years". It was made into a film starring Matt Damon and Jessica Chastain, which was released October 2, 2015. In 2015 Weir announced he was working on his second novel, provisionally titled Zhek, which he described as "a more traditional sci-fi novel with aliens, telepathy, faster-than-light travel, etc." He has since stated that that project was "back-burnered" and has moved to another hard sci-fi novel, titled Artemis, with a female protagonist, based on the Moon and set in the 2080s-2090s. The near-future thriller follows a woman named Jazz, a twenty-something constrained by her small town which is also the only city on the Moon. With debts to pay and a salary that barely covers the rent, she can’t say no when a life-changing opportunity drops in her lap. But she then finds herself in the middle of a conspiracy for control of the city itself. On September 26, 2017, it was announced that Phil Lord and Christopher Miller had been hired to develop and direct a science fiction film Artemis based on the novel. In 2016, Weir released The Principles of Uncertainty collection of short stories on the TAPAS app platform for short fiction. In 2017 CBS picked up a pilot written by Weir titled Mission Control, following a group of young NASA astronauts and scientists. In May of the same year, Weir collaborated with webcomic artist Sarah Andersen to remake Cheshire Crossing for the website Tapastic. Weir lives in Mountain View, California, in a rented two-bedroom apartment. Since he has a fear of flying, he never visited the set of the film adaptation of The Martian in Budapest, where most of the scenes set on Mars were shot at Korda Studios. In 2015, with the help of therapy and medication, he was able to fly to Houston to visit the Johnson Space Center, and to San Diego to attend Comic-Con. Weir has stated that he is agnostic. He has described his political views as fiscally conservative and socially liberal. "Yuri Gagarin Saves the Galaxy"
^ a b c d Rowe, Georgia (10 March 2014). "Andy Weir's self-published 'The Martian' travels through space to best-sellerdom". San Jose Mercury News. Retrieved 10 December 2014. ^ "Philosophical 4chan". Reddit. Retrieved 8 May 2015. ^ "2016 Hugo Awards Announced". The Hugo Awards. Retrieved 26 August 2016. ^ Vilkomerson, Sara. "Andy Weir on his strange journey from self-publishing to Hollywood". Entertainment Weekly. Retrieved 25 June 2015. ^ "The Martian". Skepticality. Retrieved 5 March 2015. ^ a b Altar, Alexandra (14 February 2014). "A Survival Guide to Mars". The Wall Street Journal. Retrieved 10 December 2014. ^ Blizzard Entertainment. "Warcraft II: Tides of Darkness (1995) DOS credits - MobyGames". MobyGames. ^ Blizzard Entertainment and ChartyMcFarty69 (3 January 2013). "Warcraft II: Tides of Darkness - Orc Ending and End Credits". YouTube. 1:27 minutes in. ^ Novelli, Michael A. (2 October 2008). 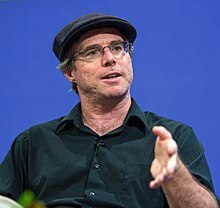 "An Interview with Andy Weir, author of Casey and Andy". The Agony Booth. Retrieved 3 May 2015. ^ Garrity, Shaenon (2 May 2016). "The Old Masters". The Comics Journal. Retrieved 3 May 2016. ^ Moran, Rita (10 January 2013). "Moorpark College students write, direct and stage five intriguing one-acts". Ventura County Star. Retrieved 10 December 2014. ^ "Bestsellers: Hardcover Fiction". The New York Times. 16 March 2014. Retrieved 10 December 2014. ^ Shippey, Tom (7 February 2014). "Book Review: 'The Martian' by Andy Weir". The Wall Street Journal. Retrieved 10 December 2014. ^ "The Martian". Fox Movies. Retrieved 8 September 2015. ^ Brock Wilbur (28 March 2016). "How 'The Martian' Impacted the 'Ready Player One' Movie". INverse. ^ "I am Andy Weir, author of "The Martian", soon to be a major motion picture. AMA!". Reddit. January 2015. ^ "huff interview AMA!". Huffingtonpost. December 2015. ^ "Fox Scores "Martian" Author's "Artemis"". Dark Horizons. May 2017. ^ Jr, Mike Fleming (September 26, 2017). "Phil Lord & Christopher Miller To Direct 'Martian' Author Andy Weir's New Novel 'Artemis'". Deadline. Retrieved September 26, 2017. ^ a b Ryan Britt (24 August 2016). "'The Martian' Author Andy Weir's New Story Isn't a Book, It's an App". inVERSE. ^ Andreeva, Nellie (17 January 2017). "CBS Picks Up Dana Klein-Mark Feuerstein Comedy Pilot, NASA Drama". Deadline. Retrieved 11 May 2017. ^ Krishna, Swapna (24 May 2017). "Tapas' Cheshire Crossing: Interview with Andy Weir and Sarah Andersen". Syfy. Retrieved 7 January 2018. ^ a b Sheryl Garratt (11 September 2015). "The Martian: how a self-published e-book became a Hollywood blockbuster". The Telegraph. Retrieved 7 October 2015. ^ "The Skeptics Guide to the Universe". Skeptics Guide (Podcast). 3 October 2015. Retrieved 7 October 2015. ^ Nick Goundry (25 September 2015). "Ridley Scott and Matt Damon film The Martian on location near Budapest". The Location Guide. Retrieved 7 October 2015. ^ Vilkomerson, Sara. "Andy Weir on his strange journey from self-publishing to Hollywood". Entertainment Weekly. Retrieved 8 May 2015. ^ Berger, Eric (5 August 2015). "Would Andy Weir, author of The Martian, ever go into space? Hell no, he says in a lengthy interview". SciGuy blog. Houston Chronicle. Retrieved 28 November 2015. ^ "I am Andy Weir, and I wrote "The Egg". AMA". Reddit. Retrieved 8 May 2015. ^ The Martian, Random House. Accessed 13 February 2018. ^ "Andy Weir: The Short Story Prequel to The Martian". WHSmith. 30 September 2015. ^ Andy Weir. Der Mars Survival Guide (in German). Heyne Verlag. ASIN B0759RS89L. This page was last edited on 25 February 2019, at 22:13 (UTC).